The opening of the U.S. embassy in Jerusalem is extraordinarily controversial. 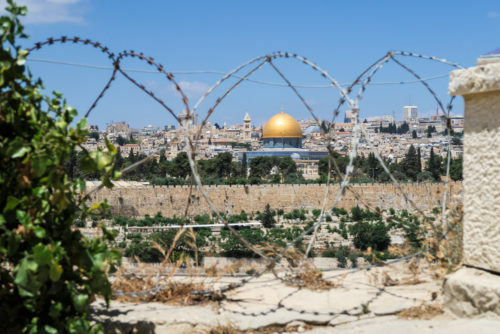 It’s located in part of the city that Palestinians believe should be the site of their own capital and that many international observers consider occupied territory seized by the Israeli government in 1967. The inaugural event itself spurred an outbreak of protests among Palestinians in Gaza, about 40 miles away from Jerusalem. Israeli troops fired on protesters attempting to cross the border fence, killing at least 41. But leave it to the Trump administration to add insult to injury. For the inaugural event today, the White House chose not one but two homophobic ministers to deliver prayers at the event. Robert Jeffress is one of Trump’s main boosters for the evangelical community. He also is a rabid homophobe who makes no effort to hide his hatred for all things LGBTQ. It’s not just LGBTQ people that Jeffress hates. He has said that Mormons are a cult, the Catholic Church is an instrument of Satan and that Muslims are going to hell. He’s also said that Jews are going to hell, which makes him an awkward choice for this particular event. Jeffress was joined by John Hagee, who is equally offensive. Hagee said that marriage equality was a sign that “America does not have purity.” He blamed Hurricane Katrina on LGBTQ people. Hagee caused John McCain headaches during his 2008 presidential campaign when Hagee’s anti-LGBTQ rhetoric became widely known. Hagee had endorsed McCain, but McCain disavowed him after the preacher was quoted as saying that Hitler was doing God’s work. Like Jeffress, Hagee is also anti-Catholic (he’s called the Church “the great whore”). Of course, in Trump’s administration the very bugs that were disqualifying in the GOP a decade ago are now the best features. Both Jeffress and Hagee have been big Trump supporters, and they help cement the affection that conservative evnagelicals, the core of Trump’s base, have for the president. Putting the U.S. embassy in Jerusalem. is not just a political move for the religious right. It’s a theological one. Conservative Christians see the creation of a Jewish state as not only fulfilling a Biblical prophecy but also a sign that the end times are approaching. Jerusalem is a crucial location in this belief. Of course, almost no one made any noise about the prominent of Hagee and Jeffress at the embassy ceremony. Supposed LGBTQ allies Ivanka Trump and Jared Kushner were happy participants in the event. The only major Republican to complain was Mitt Romney. In a tweet, the failed presidential candidate and now Senate candidate, said that Jeffress (but not Hagee) was “a religious bigot,” citing Jeffress’s comments on Mormons and Jews. Not his comments on LGBTQ people, of course.